All of 4.5 weeks into my return to the working world, and I’m ready for a vacation. The fact that those 4.5 weeks contained a holiday—a holiday that had the nerve to fall awkwardly on a Wednesday, thus negating all productivity on both ends of the week—does not reflect positively on my employment stamina. Current PTO (paid time off) balance: three hours. Time to embrace reality and polish my pumps; I’ll be wearing them for the foreseeable future. Full-time employment, for the most part, is not the most riveting thing to do with one’s day, even when one is (like me) incredibly grateful to have a job. To those who identify with the lucky few that wake with a bounce and relish their work each day, I salute you, and I will listen to every pearl of advice you have to share. To the rest of you: let’s go to happy hour. Happy hour is probably one of the greatest inventions, ever. I don’t care if you work in a stodgy office, a classroom, or a gas station: some days, you just need a drink. If you don’t drink, have a lemonade. It feels good to unwind. While I love going out for good ol’ HH (who doesn’t love a pint or plate of fries more when its on the cheap? ), relaxing in sweats with an adult beverage from my home bar can be satisfying too. I’ve been adding to it over the past few months and can now mix a modest amount of cocktails. Ben, however, doesn’t quite share my enthusiasm for breadth. A serial vodka-tonic man, Ben leaves the margaritas, whiskey-gingers, and lemon-drops for my exclusive enjoyment. While I don’t mind (especially since he generously plays cabbie when we’re out), this has left me with an interesting realization: nearly every bottle of alcohol in our place is, well, mine. Before you judge me to be a sad, slushy case, allow me to add the following disclaimer: until I open my doors to a gaggle of Wisconsin sorority girls, it is going to take me a calendar year to work through this stuff. 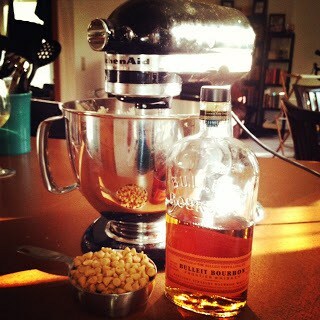 Not wanting bottles to gather dust, I developed a creative solution that fuses two of my loves: happy hour and baking. Want to add some je-ne-sais-quoi to your cake or bang to your brownies? Throw in some spirit! Two underused handles prompted me to juice up two delicious desserts: Bulleit bourbon and Malibu rum. I do strive to start with ingredients on hand, after all. The results: CHOCOLATE COCONUT RUM CUPCAKES and BOURBON BUTTERSCOTCH BLONDIES. Let’s put dessert before dinner. Happy hour has arrived! Thank you Marta Stewart for providing the base of this recipe: a brownie-rich chocolate cupcake. Best chocolate cake recipe to come out of my oven to date. A few minor tweaks add the Malibu magic. Preheat oven to 350°F. Line 12-cup muffin tin with paper liners. In a medium bowl, sift together cocoa power, flour, baking powder and salt. Set aside. In a larger bowl, cream butter and sugar until light and fluffy. Add eggs, one at a time, beating well after each. Beat in vanilla and 1 tsp. coconut rum. With mixer on low speed, add half of flour mixture. Mix in sour cream. Add remaining flour mixture. Pour or scoop batter into cups (liners should be about 3/4 full). Bake 20-25 minutes or until a toothpick inserted in the center comes out clean. While cupcakes are still in tin, poke holes in the tops with a fork or skewer. With a pastry bush or small spoon, gently brush remaining 1/4 c. coconut rum onto top of cupcakes. Remove from pan and place on wire rack to cool completely. In a medium bowl, beat cream cheese and butter until fluffy. Gradually add the powdered sugar, 1 cup at a time, alternating with heavy cream. Beat in remaining ingredients and continue to mix until frosting is smooth and spreadable. Frost cupcakes. Top with additional shredded coconut, if desired. All I need is a palm tree. Or a glass of milk. Packed with butterscotch chips, chocolate chips, and pecans. Nothing bad in here! This recipe originated from a woman who, in my mind, has one of the sweetest jobs out there. Dear Smitten Kitchen: hiring an assistant any time soon? Preheat oven to 350°F. Butter an 8×8 in. pan. Place pecans in a small skillet on low heat. Toast, stirring occasionally until nutty and fragrant–a few minutes or so. Mix melted butter with brown sugar. Beat until smooth. Beat in egg, vanilla, and bourbon. Add salt. Stir in flour by hand. Stir in nuts, chocolate chips, and butterscotch chips. Pour into prepared pan. Bake for 20-25 minutes, or until set in the middle. It may still be a little gooey–no one will complain. Evidence of an immediate quality test. You can’t be too careful…better eat two. So great to hear from you! Sweet tea vodka?! What a “problem” indeed :-) I’m sure you can come up with plenty of yummy ways to use it right up (and please pass them along!) Hope the blondies turned out well. Thanks so much for commenting– it always makes my day!